The Arthurian legends have had a profound effect on British fantasy, and some of that has carried over to the United States as well. Merlin, especially, seems to make a lot of appearances in recent fantasy fiction, having been everything from the first King of Xanth to the namesake of an order in the Harry Potter universe. Really, though, Arthur and Merlin don’t have a whole lot to do with Oz. There is a bit in John Dough and the Cherub in which Nebbie, right-hand man to the Kinglet of Phreex, tells his ruler that the word “devoirs” was used by King Arthur and Richard Coeur de Leon. This might well have been true in the latter case, since I’m pretty sure Richard spoke only French. 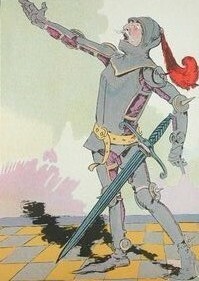 Ruth Plumly Thompson shows Arthurian influence in her introduction of Sir Hokus of Pokes, who is initially presented as having come from Arthur’s England, although Thompson later changed her mind and made him a native Ozite. Really, Merlin is such a mysterious character that you could fit him in to just about any fictional universe. 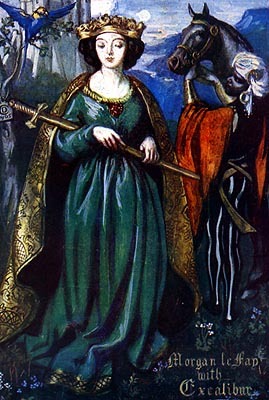 Speaking of Oz and Arthuriana, I recently thought of another interesting correlation between the two universes, which is the similarity between Ozma and Morgan le Fay. Not in terms of personality, that is, but as far as the origin stories go. Morgan was apparently originally a fairy, but was eventually changed into Arthur’s half-sister, who still had magical powers but was entirely human. And with Ozma, it was sort of the reverse of that. When she’s first introduced in Land, L. Frank Baum just tells us that she’s the daughter of Pastoria, the former King of Oz. Later, however, she’s presented as a full-fledged fairy, and Magic even suggests that she has existed since the beginning of time. I’ve addressed this conundrum before, but it just strikes me as interesting that both figures are said to be both human and fairy. Maybe Morgan was brought to England to be its greatest ruler in the same way Ozma was for Oz, but Merlin threw a monkey wrench into the works. I guess that kind of makes him the equivalent of the Wizard of Oz, although he never ruled. Do I have something here? I mean, if Marcus Mebes could make Lurline an Olympian goddess, why not? This entry was posted in British, Characters, Harry Potter, Magic Items, Mythology, Oz and tagged gina wickwar, john dough and the cherub, king arthur, king richard coeur de leon, kinglet of phreex, margaret berg, merlin, merry go round in oz, morgan le fay, nebbie, ozma, pastoria, piers anthony, robin brown, ruth plumly thompson, sir gareth, sir hokus of pokes, sonny burns, the magic of oz, the marvelous land of oz, toto of oz, wizard of oz, xanth. Bookmark the permalink. 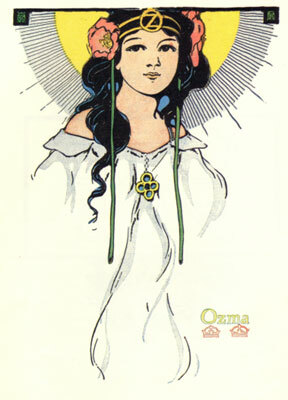 I have Ozma as the product of Pastoria and Lurline coming together. Not too Oz-shattering as that is what is listed in the wiki’s and such. Book III of my series will open with Lurline and the Council of the Olympians. Jack Snow had it that Lurline delivered the baby Ozma to Pastoria, which doesn’t necessarily indicate that he isn’t the biological father, but that didn’t appear to be the intention. Merry Go Round has Ozma remembering her time in Burzee before the Unicorn came to Halidom, which would presumably have been centuries earlier. Yep-love all the contradictions. As if each book was a parallel world….. But then the plots wouldn’t affect each other, would they?